Sunchokes (also known as Jerusalem Artichokes) have a sweet and nutty flavor. 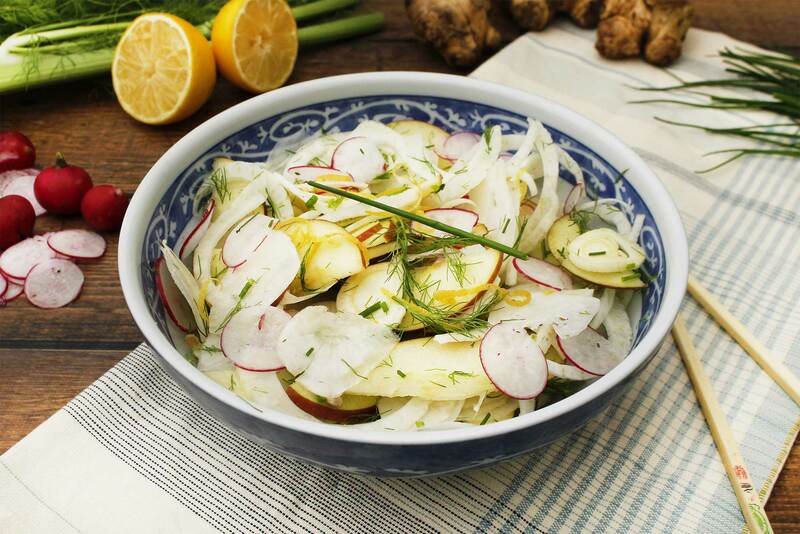 This crispy salad is marinated in a rice wine vinaigrette, then tossed with fennel, radishes and apples. Fill a medium bowl with water and ice. Cut one lemon in half and squeeze the lemon juice into the bowl, then place the two halves into the bowl. Set aside. Prepare the radishes, sunchokes, apples and fennel and put them in the acidulated ice water while you work. In a medium bowl, whisk together the olive oil, vinegar, honey, soy sauce, 2 tablespoons lemon juice, 2 tablespoons lemon zest, chives, ginger and fennel fronds to make the vinaigrette. Season with salt and pepper to taste. Drain the radish mixture, then add the radishes, sunchokes, apples and fennel to the dressing. Toss well, cover, and refrigerate for at least 30 minutes or up to 1 day, to allow the flavors to come together. Garnish with more chives and lemon zest if desired.